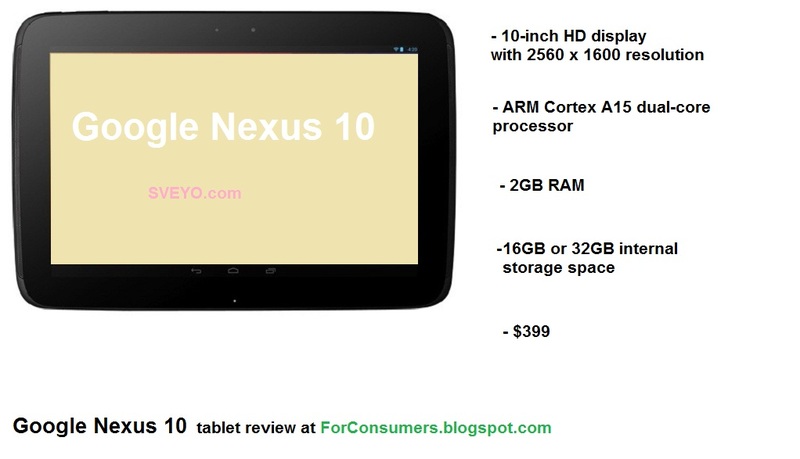 Google Nexus 10 review - in this hands-on video review we will present you the brand new powerful tablet from Google. It comes in addition to the successful Nexus 7 tablet and the Nexus smartphones. It is our opinion that Google made this offensive launch of different Android devices to answer Microsoft's ambitions with their upcoming Windows 8 which as it seems will dominate mobile devices in near future. So, what is the all new 10-inch Google tablet all about. First of all we have to say that it is really a high quality product. The build quality of the Nexus 10 tablet is very good. One thing we didn't like is the fact there's plenty of plastic around the display itself which makes the device look much bigger (not that it is small). Other than that the Nexus 10 is a very thin device (8.9 mm) and weighs just 603 grams so it is more on the compact size. Probably the best feature in the Nexus 10 tablet is its display. The gorgeous 10-inch HD display has resolution of 2560 x 1600 and powerful graphics processor. Watching movies in Full HD on this display is just an amazing experience and a real pleasure. The display and the advanced hardware performance make this tablet truly a great multimedia device unlike any other tablet on the market. Playing games, surfing the web or reading e-books is all perfect when you have a great display like the one of the Nexus 10 tablet. The screen itself is slightly curved and Corning Gorilla Glass 2 is used to cover and protect this high resolution masterpiece. The amazingly fast dual-core ARM Cortex A15 processor and 2GB of RAM make this devices quick and responsive and with the advanced MIMO WiFi connection you get fast Internet connectivity for perfect browsing experience. Google Nexus 10 is offered in either 16GB or 32GB versions for internal storage capacity. You also get a bunch of connectivity options with this tablet - Bluetooth, Micro HDMI, Micro USB, NFC and a 3.5mm headphone jack. The sensors built in the Galaxy 10 tablet include Accelerometer, GPS, Gyroscope, Barometer, Ambient Light, Compass. The 5MP autofocus camera with flash is placed on the back of the tablet and there is another 1.9MP front facing camera which is perfect for video chat and calls. The Nexus 10 tablet comes with the latest Android 4.2 Jelly Bean operating system. With this tablet you get not only stunning hardware but the best of Google's software. This includes all the latest updates for Android like the advanced features of Google Now, the recently updated Google Maps with Street view and of course the ability to choose from the thousands of apps in the Google Play store. Probably now many of you will say that the only thing that's missing is 3G connection but that is not the purpose of this tablet, it is not a smartphone after all. Google Nexus 10 tablet comes at the price of $399 for the 16GB version. For the amazing package you get this price may be considered a real bargain.